POINCIANA -- Carole Athias says her allergies are so extreme she had to replace the grass in both her front and back yards with concrete. Now the Poinciana resident has 20 days to respond to a lawsuit filed by her Homeowners Association. Athias thought she was in the clear after she obtained permits from the city of Poinciana, but that's when the real headache began. 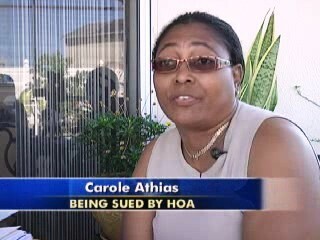 The HOA fined Athias $200 for putting in the concrete. HOA told her she could keep the concrete only in her front yard. Athias said at first, the HOA sent her a letter stating she could keep her backyard with the concrete if she got permits from all her utility companies. A few months later, the HOA denied her request. "You approved the front, why don't you approve the back? My fence is closed, I'm not bothering anybody and the utility companies approved it,” Athias said. “This is what you asked me to do!" Andre Marshall, who lives in the neighborhood, says he can't even see her backyard from the street. "It's not one of those situations where it's an eyesore," Marshall said. Marshall said he's also had a similar encounter with the HOA involving a basketball hoop. He said the HOA should be working for, not against residents. "We're actually paying people to harass us," Marshall said. Athias says she complied with HOA’s request, but a few months later the association denied her request and now she's been slapped with a lawsuit. 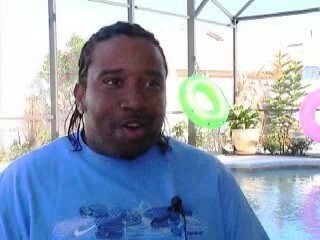 News 13 spoke with an HOA manager who said they had hoped to resolve the situation out of court. But because there is a pending legal action, the HOA declined to further discuss the lawsuit.